We moved to this house almost 12 years ago. Since day one I wanted a white wicker patio set for the front porch. 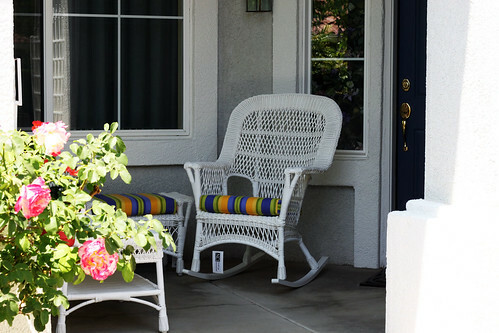 I love our front porch, but with our homes being built so close together here in So.Cal we had to wait for the trees and shrubs to grow in to give us some privacy. By then Alex was in high school, then college, so we didn’t have the money for things like porch furniture. For the past year I have been looking for an inexpensive set. Then in the paper yesterday I saw this set on sale at our local garden center. Finally a special place to knit. I think I will make new cushion covers with a fabric that goes batter with the red pots. I thought about changing the pots, but they look nice with the red brick steps. I will let these cushions wear out a bit, and see how much the summer sun bleaches out the fabric. Then I will have a better idea of a practical color and type of fabric. I am headed to the rocker now, with a cup of green jasmine tea and my sock start. I hope you can make out the arch over the front steps. That is the part I really like about the porch. This rocker is where I plan to knit. The cushions go with the front door, just not the rest of the porch. There is an arch on the side of the porch too. The love-seat can be pushed back but then it will be more in the sun. 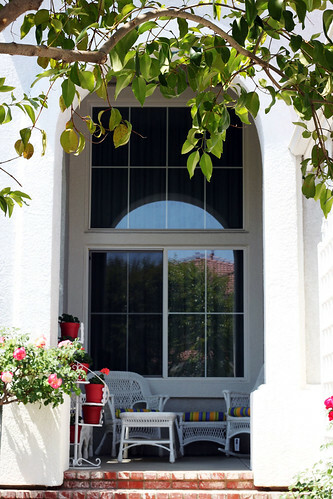 It will be nice if I can find a colorfast cushion fabric that has both the pot red and the blue of the front door. This entry was posted on Thursday, June 18th, 2009 at 3:00 am and is filed under Garden and Knitting. Tagged: Garden, Knitting. You can feed this entry. You can leave a response, or trackback from your own site. Ah, your porch shouts summertime! So cozy and inviting. What a fantastic front porch! 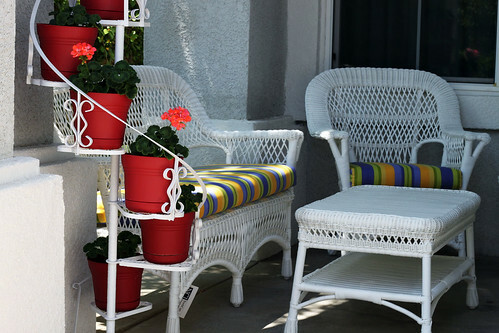 The white wicker is perfect~!